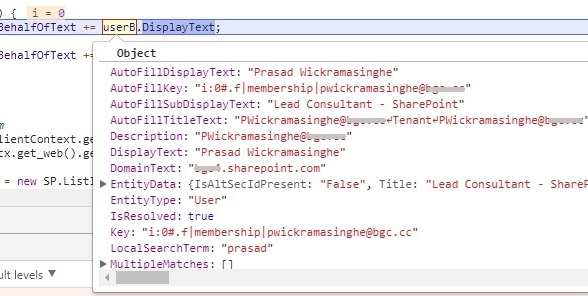 Following code sample is an example of how to use People Picker controls in a SharePoint online custom form. Just add a Script Editor webpart to a page and add following code. Hitting ‘Test on Console’ button will log selected people’s names in the browser console. In addition to name, there are other properties that you can directly use as shown in the following image. // Initialize People Pickers after loading clientpeoplepicker.js file. // objects to set the picker value, and a schema that defines picker properties.